Fred Darby was born in Hull in 1894. He was the son of William Darby (b.Grantham) and Elizabeth Millhouse Lilly (b.1864 at Woolsthorpe by Belvoir). The couple married in 1887 in Grantham and by 1891 were living in Sculcoates, Kingston upon Hull. William Darby was working as a fitter. At the time of William’s death in 1897, the couple had 2 sons, Walter and Fred and were expecting a third child, Sidney, who was born in 1898. Elizabeth Darby returned to the Bottesford area with her family and subsequently married Charles Guy in 1900. In March 1901 the census records the family as living at 5 Retford Cottages on Chapel Street. Charles Guy was born in Bottesford and worked as an agricultural labourer. All 3 boys are recorded as his sons in 1901. By 1911 Walter and Fred were listed as ‘boarders’ presumably because they were wage earners and contributing to the family income. Sydney was at school and the children from Elizabeth’s second marriage were Ada, Harry and Arthur Guy. Fred, by then aged 16, was working as a gardener’s boy at a local nursery and sang in the St Mary’s Church Choir. Fred and Walter Darby both served in the forces during WW1. 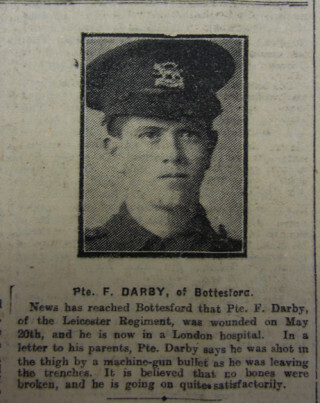 Their younger brother Sidney Darby may well also have served, being of eligible age to be conscripted in 1916 or 1917, but his record has not been identified. 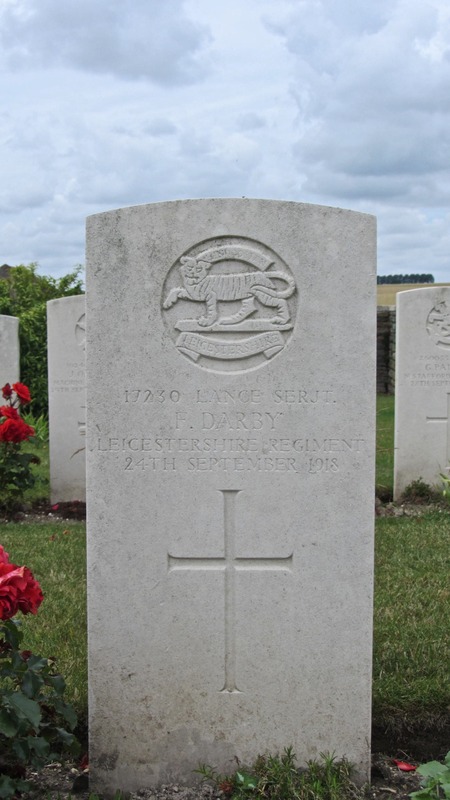 According to the ‘List of Soldiers who Died in the Great War’ Fred Darby enlisted in Melton Mowbray as a Private with the Leicestershire Regiment. His Service Number was 17230. Unfortunately his detailed service records do not survive. However, another Bottesford recruit, Thomas William Skinner also enlisted as a Private with Leicester Regiment in Melton Mowbray and was allocated the previous number 17229, This indicates that they must have enlisted at the same time. Thomas Skinner’s pension records are still available and show that he enlisted on the 6th March 1915, a Saturday. Perhaps Fred and Thomas travelled together the 16 miles to Melton Mowbray. Or perhaps they met by chance on their day off in Melton. Whatever the circumstances these young recruits were to experience the full rigour of front line action. Thomas and Fred were 17 and 20 years old respectively. However, Thomas gave his age on enlistment as age 19. We do not exactly when Fred Darby was posted to France. It was 6 months before Thomas Skinner saw overseas service. If Fred had a similar length of training he would have gone to France in the autumn of 1915. 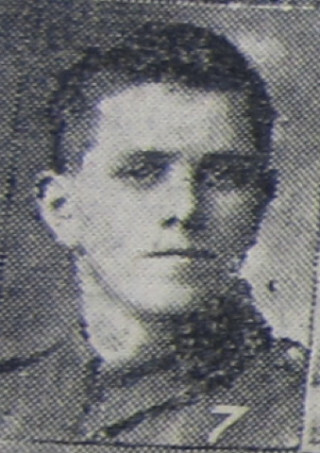 Fred Darby would survive three woundings and achieve promotion to Lance Serjeant in three years of service with the Leicestershires. He was killed on the 24th September, 1918, just 25 years of age, near the Somme during the last 100 days of the war. His death occurred as part of the same action in which his near neighbour Albert Asher lost his life. Thomas Skinner would die age 20, at home in Bottesford, in June 1918, after being invalided out of the Army in January of that year. Fred Darby’s Medal Index Card lists his service as being with the 1st Battalion, Leicestershire Regiment. 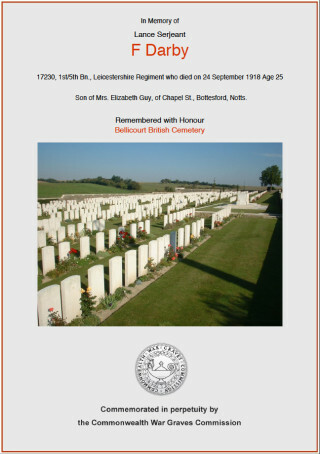 However by the time of his death he was serving with the 1/5th Battalion, Leicestershire Regiment. His injuries give a clue as to his battalion postings. 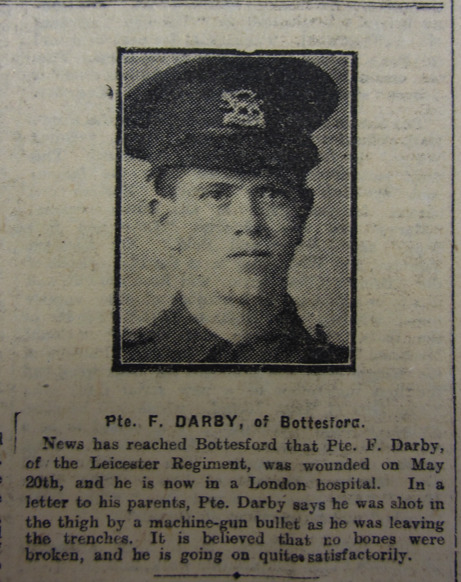 The Grantham Journal reported that Fred Darby was wounded on May 20th 1916. ‘In a letter to his parents (he) says he was shot in the thigh by a machine-gun bullet as he was leaving the trenches.” Apparently no bones were broken and he was making a satisfactory recovery. According to the War Diaries of the 1/5th Battalion were not in the front line on that date. They were in training at Lucheux, a village in the Department of the Somme about 7 kilometres north-east of Doullens. Although they did not know it, they were preparing for the start of the Battle of the Somme on the 1st of July 1916. However the 1st Battalion, Leicestershires were in the trenches. They were stationed in the Ypres Salient near Poperinghe and were sent to relieve the 2nd Sherwood Foresters in front line trenches in support of the 16th Brigade near Brielen. This section of the trenches had been heavily bombed and working parties were sent out in 2 hour shifts to improve dugouts. On the 29th May 1916 the 1st Battalion suffered 7 casualties wounded. If it is the case that Fred was with the 1st Battalion it is likely that he was one of those casualties. His ‘blighty’ wound would have saved him from deployment to the Somme with the 1st Battalion in August. On Friday 1st of June 1917 one year later, The Melton Mowbray Times & Vale of Belvoir Gazette reported ‘the following casualty (…) in the official list issued for publication on Saturday afternoon:- WOUNDED. LEICESTERSHIRE REGIMENT. Darby, 17230 Lance-Corpl. (Bottesford). This would indicate that Fred was injured before the Saturday 26th May 1917. Both the 1st and the 1/5th Leicestershires were in action immediately prior to that date near Lens in the area of Vimy Ridge. However it is likely that Fred had been transferred by the 1/5th Battalion. He is mentioned by name in J.D Hills’s book – ‘The Fifth Leicestershire A Record Of The 1/5th Battalion The Leicestershire Regiment’. The 1/5th was again in the Lens area. Hills describes the conditions of their posting (p.223 -224). We do not know if this injury hospitalised Fred Darby. However he is referred to by name once more in J.D. Hills narrative when describing an advance on the village of Pontruet near the Somme during the last hundred days of the war. They advanced on the 24th September at 5.00 am and were surprised by heavy German resistance. Albert Asher his Bottesford neighbour’s death is chronicled as occurring within 15 minutes. Fred Darby had survived over three years of front line action and three injuries, He had also achieved promotion by the time of his death on 24 September 1918, to the rank of Lance Sergeant. He had clearly made his make in the Battalion to have figured twice J.D. Hills’s regimental history. Many of the those killed in the Pontruet action were originally buried in an extension to the Pontruet Communal Cemetery. They were moved to different cemeteries after the war. Fred Darby’s and Albert Asher’s graves were separated in those moves. 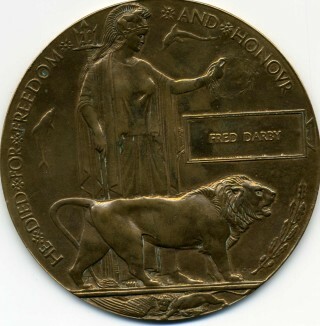 Fred Darby was finally laid to rest in 1920 at Bellicourt British Cemetery, Aisne, France. He was remembered by his family at home. In addition to receiving his medals and memorial plaque a commemorative certificate was acquired early in the 1930’s. 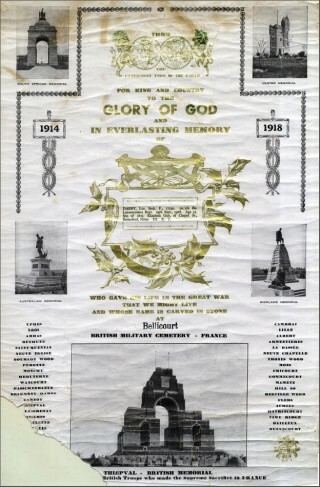 It lists the battles fought on the Western Front and is over printed with the Bellicourt British Military Cemetery. It also shows an image of the completed Thiepval Memorial which was completed in 1932. 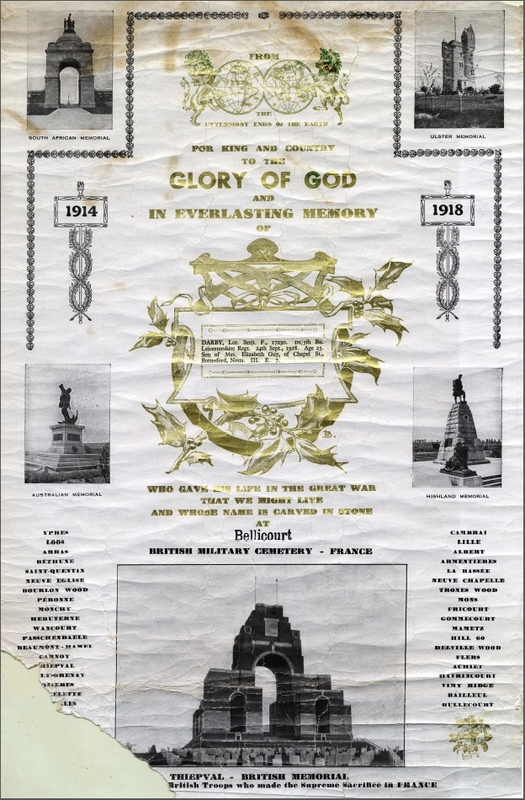 Perhaps it was acquired on one of the many ‘pilgrimages’ families made to France as the war grave cemeteries and memorials were completed in the inter war years. We are grateful to Mrs M. Beevers for granting access to Pte. Fred Darby's medals, commemorative plaque and certificates.